Calcification is a process where plaque in the arteries gets progressively harder. It then adheres to the cholesterol build up that is already there and causes a worsening of the condition known as atherosclerosis or hardening of the arteries. What scientists are unsure of at this point is how much of atherosclerosis is from the cholesterol build up and how much of it is calcium. Either way, reducing cholesterol is believed to reduce the rate of hardening and narrowing of the arteries thereby reducing the risk of heart disease. New tests related to the impact of calcium to the arteries are designed to measure the amount of calcium versus regular plaque that is the result of failure to reduce cholesterol intake. As the tests become more conclusive, it is hoped that they will become a routine part of screening for risk factors to heart disease. What is already known is that calcification is slowed when there is little or no plaque in the arteries. This happens when a healthy diet low in fat and cholesterol is coupled with good genes. While people have no control over their genetic make up they can control what they eat and how well they manage other conditions. For example, preventing calcification within the arteries involves maintaining a healthy weight, controlling diabetes and blood pressure and reducing cholesterol. Those with high cholesterol are often put on cholesterol lowering drugs called statins. These are effective in reducing cholesterol but are often accompanied by undesirable side effects. Learning how to manage cholesterol without drugs eliminates such risk factors. 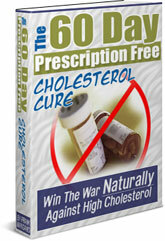 To find out more, get The 60-Day Prescription Free Cholesterol Cure.